Finish Line products are a favorite at Red Coat Farm. Few people are more qualified to talk about performance horses than Lisa Goldman. She's spent her whole life around them, after all. Lisa grew up on her mother's Red Coat Farms in Hawthorn Woods, Illinois, right outside Chicago. She started lessons at a young age and went on to win multiple Grand Prix titles. Lisa also competed in the 2016 United States Equestrian Federation Show Jumping Development Tour, which took her and her horses, Centurion B and Hindsight, to Belgium and Slovakia. Here, Lisa shares her family's philosophy, her experience traveling internationally, and how she keeps her horses healthy. When asked what the most exciting experience of her life was, Lisa was quick to answer. "Being on the nation's cup team," she explained. "You always hope you're going to make it to the next level. Getting there, getting that red coat, that's a huge step of a childhood dream being realized." It was also the first time her horses had flown internationally. Both Centurion B and Hindsight were born in the U.S., and although they'd competed in events all over the country, the two of them had never flown before. Thankfully, they both aced their first flying experience. The horses were in shipping containers similar to horse trailers, so once the plane leveled off, their trip wasn't much different from traveling on the ground. Plus, Lisa gave them U-7 Gastric Aid to help prevent stress-related ulcers. "Takeoff was the most traumatic part," Lisa noted. "Landing wasn't as bad – it's like going over a pothole." "Riding represents a deep bond between rider and animal." Having spent years raising horses and giving lessons, Lisa knows riding is more than a form of physical activity. It represents a deep bond between rider and animal. "When you ride, you have an animal underneath you that you are trying to make do all sorts of things," she explained. "A split second decision could be fatal if you don't have a partner underneath you that trusts you, can cover for you and doesn't hold it against you if you make a wrong decision." The horse has to come first, she elaborated. It needs the correct muscle tone, food, diet and supplements, both to do the acts requested of it and to trust its rider. Many horse enthusiasts would agree. Providing the right products further develops the bond between riders and their horses, establishing trust and allowing the two to work in synch. "It starts from the ground up," Lisa said. "The horse needs to care for you, needs to feel comfortable doing his job for you." Lisa consistently turns to Finish Line products to meet her horse's nutritional needs. All of the Red Coat equines respond well, she said, and there's a notable difference in performance. "All of our horses are on Total Control," Lisa elaborated. "Their hooves are great, their coats are great." 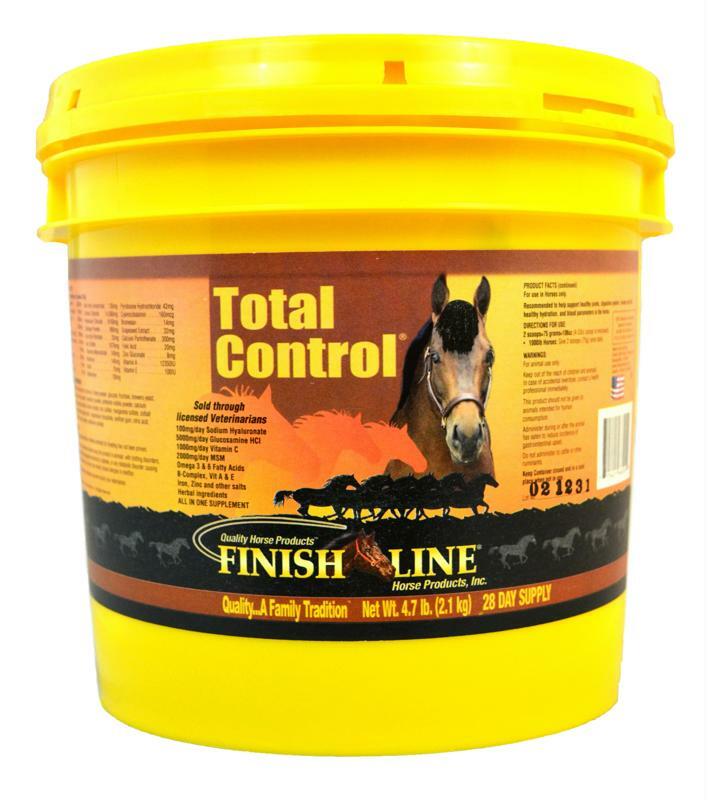 Total Control combines Finish Line's five best-selling products into one easy-to-use, great-tasting supplement. Lisa noted the product is great at supporting her horses' nutritional needs without overloading them on supplements. Even the Red Coat equines that don't compete get Total Control for their overall health. Total Control supports multisystem health. The Red Coat horses training for competition also get Muscle Tone for its amino acids, which come in handy during hard show work. During the hot training months, Lisa and her mother add Finish Line's electrolytes to support healthy hydration levels. Of course, Lisa is no stranger to the anxiety horses experience when it comes to travel. Even though her horses travel well, she always gives them U-7 Gastric Aid beforehand. Studies have shown U-7 supports a healthy foregut and hindgut and minimizes the occurrence of ulcers. Finish Line is proud to support Lisa, and her philosophy reflects our own. Finish Line believes in quality ingredients that support the health of your horse and strengthen the bond between animal and rider.